I have owned, shot, and handled many guns since my childhood and few have ever given me the pleasure of ownership that my simple Marlin 1895G has. The 45-70 caliber can be a little rough on the shoulder but itâ€™s worth it as one of the best brush gun calibers I have ever owned or fired. It shoots flat and hits hard but to make the most of this excellent caliber, consider matching it with one of the best scopes for the Marlin 45-70. If you are a deer hunter in much of the eastern U.S. and havenâ€™t tried a 45-70, I highly recommend you do so. The thick limbs and brush have very little effect on such a heavy, slow-moving bullet. At close range it is devastating but in the right hands and the right optic, you can get shots out about as far as you would want to take them with any reasonable gun. The sights for the marlin 45-70 from the factory are a little lacking in this hunterâ€™s opinion, especially for a hunter. There are plenty of aftermarket sights available but before going through the pain of changing to other iron sights, consider trying out a scope. If you make the right choice you wonâ€™t be disappointed but you need to pick the right scope. There are a few unique traits that you are going to want in a scope for a gun with so much oomph behind it that has such a large bullet. Donâ€™t go and slap some cheap 20x scope on your rifle and expect the scope to last or the gun to perform like other calibers because it wonâ€™t. To break it down, these are the optimal traits you want in a scope for marlin 45-70 guide gun, standard model or tactical model. Since itâ€™s what we all look at first, it is only appropriate to talk about what works best in this case. There is little need for ultra-powerful magnification. You are just wasting money and making your life harder than it needs to be. The 45-70 caliber is renowned for accuracy but that is in the windage not in the elevation. It may stay straight left to right but will drop alarmingly. More powerful scopes will run out of adjustment before you get out to the range they are capable of. Instead, opt for something in lower power. I feel that 7x is about optimal but a scope between 5x and 10x is appropriate. In the areas where this caliber excels, you arenâ€™t going to need more than that. In fact, many people have opted to use a lower powered shotgun scope on 45-70 rifles to great effect. I cannot overstate how important it is to have sufficient eye-relief on a 45-70 scope. I have been kicked harder but the push for my 1895G is enough that I know I would get nailed in the eye by a scope if I had to get too close to it. If that has never happened to you, itâ€™s a pain that you never want to experience. Stick with something the longest eye relief you can get, I want something more than 4â€� if I can get it and would be happiest around 6â€�. Of course, this is going to rule out any of the more powerful optics as they generally have low eye relief as a side effect of high magnification. Itâ€™s a worthwhile tradeoff in my opinion but go with your own strength and size, if you can handle the recoil well you may be fine with lower eye-relief. This is a two-fold requirement. Firstly, you want all of the standard durability options you can get on a scope like water and fog proof and the ability to stand up to the hunting environment. We drag our poor rifles through thick brush and lean them against trees, though the 45-70 is at home in these conditions your scope may not be. Get something that can stand up to what we endure. Secondly, any scope for 45-70 govt rounds needs to be able to stand up to the beating it will take from the recoil. If you get a cheap scope you may end up jarring the glass loose or even causing issues with the adjustments. Maybe I am being over-cautious but I would rather do that than have to replace a scope that I have already sighted in. Rather than go into all of the specifics that go into this one single topic separately, just understand that not all scopes are created equally and getting one with good glass that is clear and bright will be a huge benefit when you get out in the woods. Shooting under clear skies is one thing but under the shade of a dense tree canopy, image quality is everything. Most low magnification scopes can get by with smaller objective lenses. The larger the objective the brighter the image at a given magnification but something in the 20mm to 30mm will do just fine. Any smaller and you do risk a dim view not to mention a low field of view. You can go larger if needed but you wonâ€™t gain much from it. Lens coating is important. Any coating at all helps but choosing a scope with multi-coated lenses will drastically improve the image quality of the scope. The coating will filter light and lower glare and other issues with scope optical quality. This is a trait of a quality optic. The overall quality of the glass may be the most important factor and for that, you need to go with the big names in most cases. There are a few budget companies that do a surprisingly good job with their glass. Vortex and Primary Arms both come to mind but they are far from the only ones. 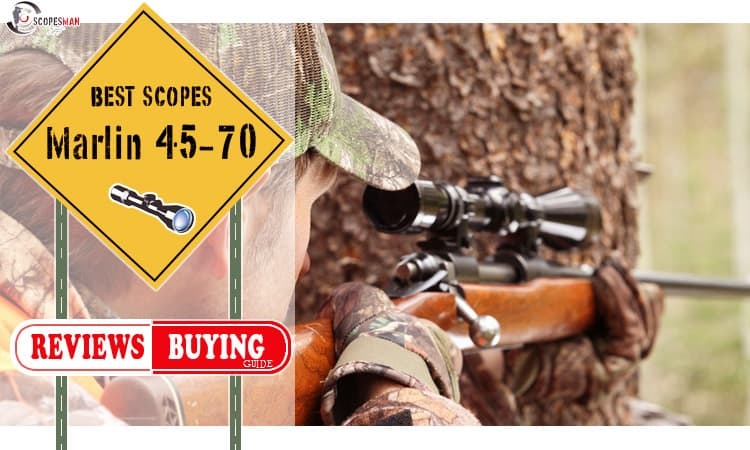 Unless you are looking at a scope for Marlin 1895 SBL 45-70s, you will need both mounts and rings. For the SBL with its integrated rail, you will only need rings or a one-piece mount making it much simpler and more versatile. For any other Marlin make sure you get quality bases that are made of steel or very hard anodized aluminum. Cheap aluminum mounts or those crappy plastic ones make me shudder. Rings should be similarly thick and made of a quality material. They should be able to hold the scope tight and not allow it to move under the stress of the shot. Donâ€™t overlook this as an important decision. Too many people pick up a quality scope then get the cheapest bases and rings they can. Itâ€™s a mistake. If you need help picking out bases for your Marlin, check out this website for some assistance. There was probably a time that I didnâ€™t seem to recommend Vortex optics quite as much as I seem to these days but their quality and price are very hard to beat. When it comes to a scope for Marlin 45-70 Guide Guns, this is my go-to, every time. It's just so hard to find a scope that does everything better and seems so well matched to the rifle. This has a very generous 9 and a half inches of eye relief which keeps your eye well off the scope to avoid any painful issues but has enough clarity with its sizeable 32mm objective and fully multicoated glass to make visibility and image quality great. The glass is superb, far better than you would expect from someone not in the big names of classic optics. The magnification is perfect for what the 45-70 needs, with a low end of 2x for those close shots or do what I do and leave it at its max of 7x and make the most of it. If you hunt the dense woods, this is exactly where you want your magnification to be. It can see close targets without issue but still has plenty of magnification for 150 yards or more with its simple but effective V-Plex Reticle. Vortex makes very durable scopes that are fully water and fog proof while being tough as nails made from aircraft aluminum and so well fitted they are shockproof to handle bumps, bangs, and the recoil you need to mitigate. They are nitrogen purged and sealed for a long life. If you can swing the price, this is the scope you want. I would almost hesitate to recommend such a new scope that hasnâ€™t had time to really be proven if it werenâ€™t for the number of these I have put on rifles and sighted in. They are perfectly aligned for our amazing rifles and, if anything, are over-engineer for the simple needs of this gun. With an astounding 11â€� of eye relief to keep you safe and truly amazing glass, this scope is clear and bright. The multi-coated glass and 30mm objective lens provide a lot of light but this scope is illuminated should you not have the light to see the reticle. Which, if you are looking for a 45-70 BDC scope, has a full bullet drop markings. While this scope isnâ€™t waterproof, it is rainproof which should get you by unless you are hunting in the worst of storms. This is a tough scope with a completely sealed and nitrogen purged one-piece tube and sold mounts and adjustments that will not move under heavy recoil. The magnification is a perfect 2-7x and an adjustable parallax to keep your image clear no matter the zoom. Unlike most scopes on a 45-70 you even get target turrets but you probably wonâ€™t need them. If you do they are zero-lock and easy to manipulate to make sighting in just a little easier. This scope also comes with Picatinny rings so you wonâ€™t even need to buy Marlin 1895 SBL scope mount if thatâ€™s your gun of choice. I would hazard to say that more rifles of more varieties have used Nikon optics over the years than almost any other, mostly due to their very attractive price and quality manufacturing. Of those Nikon optics, more than a few were from the Prostaff series. Of all of the optics on this list, Nikon has the best glass, period. They have been producing it for decades and have it down to a science. Like most of the other optics, this is a 2x-7x scope that is bright and clear with fully multicoated lenses and a sizeable 32mm objective lens. If there is a shortfall it is the roughly 4â€� eye relief which is a little short. If you use a full-length rifle you may be ok but for a scope for a Marlin 1895 GBL or one of the other lighter models, I would consider something else. Nikon scopes have always been tough and rugged scopes and the Prostaff are probably the leaders of the pack in that department. This is a fully waterproof and fogproof sealed optic that is made from high-quality aluminum and will handle any weather you throw at it. These are a common optic on shotguns and will handle the recoil well. Primary Arms made waves in the optics world a few years back when they started producing scopes of great quality for prices better than their big names competitors. They havenâ€™t slowed down but have had to share space with several newer companies that produce similar quality optics in the same price range. This scope is no slouch even though it maxes out a 4x but can be zoomed down to 1x for those really close shots where magnification makes it difficult. The optics are fully multi-coated and even with the fairly small 24mm objective lens, you get a clean image that is bright. The scope is illuminated should you ever need it. I would prefer to see a scout scope that was fog proof but this one advertises its self as fog resistant. I have never seen a fog issue on a Primary Arms scope and you certainly wonâ€™t have to deal with water as this scope is fully waterproof. It is rugged and simple and that is a beautiful thing. You arenâ€™t likely to damage this scope through any normal means. I would say the eye relief is a little on the short side but not bad at about 5â€�. I would be comfortable with shooting a rifle with one of these though I would want to pay attention to where my face was. If you are looking at budget option scope for lever action 45-70 rifles, this is it but it wonâ€™t feel budget. Simmons was the longtime king of quality on a budget and the ProDiamond is a perfect example of that mentality. If you can handle a very plain and simple scope that does everything right with no fluff to add to the price, this is the scope for you. This scope was designed for shotguns so handling the recoil of a 45-70 should be no big deal for it. Everything is solid and rugged for anything that comes your way. It is water and fog proof and made of a sealed 1 piece aluminum tube construction. I would have no worries about this scope in the field. Optically, this scope is clear and bright, especially with multi-coated glass and a 32mm objective at a fixed 4x magnification. You will have no issues with light transfer even in the dreariest woods. I used a similar scope for years and never had a visibility problem. If you want a fancy scope with bells and whistles, this isnâ€™t it. Sight it in, set it, and forget it. There are no on the fly adjustments need. I really love scopes like this, especially on a guide or brush gun. They are so hard to beat with that perfect in-between magnification that works up close or at range. First and foremost, for your own safety donâ€™t put your eye too close to the ocular lens of the scope. Itâ€™s a mistake you will only want to make once and one your eye may not survive intact. The Marlin is a light gun in a big caliber and the recoil is stiff. It's fun to shoot until it hits you in the face. Donâ€™t be that guy. The standard of sighting in at 100 yards for most rifles is not the best choice for the 45-70. The bullet drop at that range is too low and you may find yourself overshooting at the closer ranges you are likely to use this rifle. Many people recommend sighting in about an inch high at 25 yards and that will work but I prefer to sight in about 3â€� low at 100 yards. The effect of either method is about the same but I feel more comfortable and confident at a longer zero. Its insurance to make sure I was actually hitting the harder shot. While we are at it, learn to sight in your scope yourself. There is no better way to learn how to shoot with your Marlin 45-70 scope setup than doing it yourself. You will better understand how your rifle shoots and how your scope works. The process is easy enough and a worthy investment of your time and ammunition. This is very important for those who are going to rush out and get a rifle and scope as a combo. No matter which rifle you get, if it has iron sights, learn to shoot it with those before slapping an optic on it. You will get better at your fundamentals and learn about the specifics of your new gun while you are at it. This is especially true for a 45-70. You want to know what to expect from the recoil before you get your eye on a scope and understanding the impact will be useful later. Marlin 45-70s have a lot of bullet drop and most likely your scope isnâ€™t going to have a ranging reticle so being able to gauge that drop is important. I have always found that easier with open sights. I am sure we all take care of our rifles as best we can, especially one as pretty as the Marlin but many people neglect their scope. Consult your ownerâ€™s manual for your particular scope to see what needs to be done but at a minimum, always keep it clean and dry when you store it. Dust can damage the glass. Also keep oil away from the lenses, it can penetrate the scope and cause damage that water never would. I have long loved my Marlin 1895G. Itâ€™s a gun with character, made for real men with that rugged mentality and can-do attitude. It's tough and strong and all of those things we value as hunters. Why complicate it with the wrong optic. Stick with something simple without a ton of magnification and solid craftsmanship. There is nothing wrong with using a scope on one of these historically-based rifles but don't overdo it. The right scope will turn your Marlin into one of the best brush guns on the planet but the wrong one may make it almost unusable in the place where it does best. Eric grew up hunting, fishing, and roaming the hills of the Easter U.S. and has dedicated himself to becoming a well-rounded outdoorsman.Â Anytime there is an opportunity for a little fishing or a morning spent hunting, you will find him in the woods.Â In his off time, he teaches a variety of outdoor skills including land navigation and basic survival.Â Recently a Search and Rescue member, he has begun learning the ancient art of human tracking in a variety of terrains. Hey Dave! Thanks for reaching out to me. Letâ€™s not call that 33 yard buck lucky, instead we can say it was skill! Sighted in at 100 yards, you were likely about 5 inches high at that range. That isnâ€™t too bad but more than comfortable for sure! Your concern is valid with the QR rings. If your scope is off, it can change your point of impact by a couple inches or over a foot. Have you considered using see-through scope rings? I am not a huge fan of them myself but they may work for what you want. If you go with these, realize your scope is mounted much higher above your bore. Make sure you do some test shots at various ranges so you get a good idea of how things impact. If you are having vision issue, it happens to all of us, have you considered a red dot sight? There are some great ones that work well with the .45-70. Eric, thanks for great article. What do you think about the Leupold VX-R 1.25-4×20 ‘Hog’ scope? I am a fan of all things Leupold and their entire VX series of scope are absolutely stellar! For a 45-70 I think that is a solid choice and couldnâ€™t fault you at all if that is what you want to go with. It would be up there for me as well. I do have to say that I actually prefer the Vortex Crossfire series and I hate to say that. Leupold has always treated me so well but I find Vortex to have a slight edge in durability. Optically, they are very similar. Its down to price and a matter of taste I suppose.